At the risk of being prescriptive and even preachy, I'm blogging out of concern that we in the United States, perhaps alone in the world, are abandoning both our kitchens and our backyards. What do you think? For vegans and vegetarians, the Thanksgiving holiday is the cruelest time of year. It's hard to resist joining in on the ritual of eating a bit too much turkey, gravy, and stuffing. 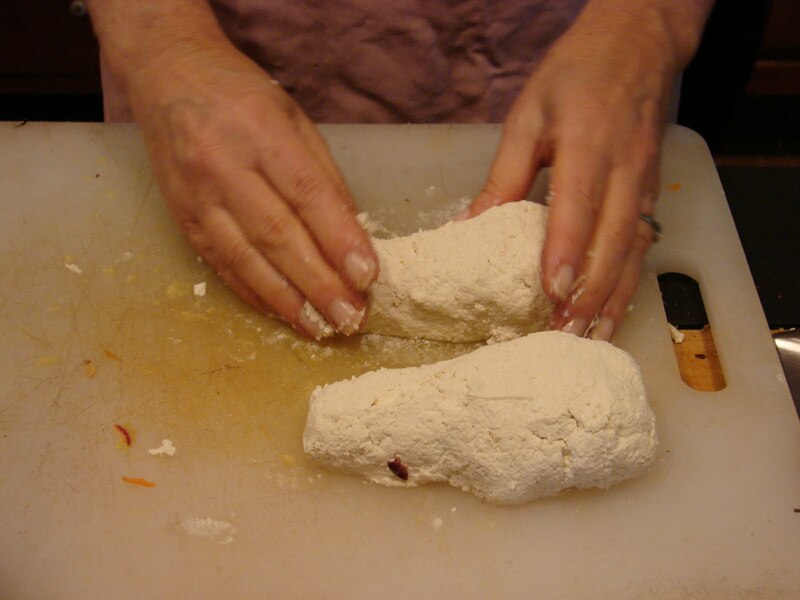 Several years ago, we discovered of a recipe for tofu turkey, and with its reasonable approximation of the real thing it has become a family tradition. Little "legs" are formed from mashed tofu, to be placed on either side of the-- well, carcass. 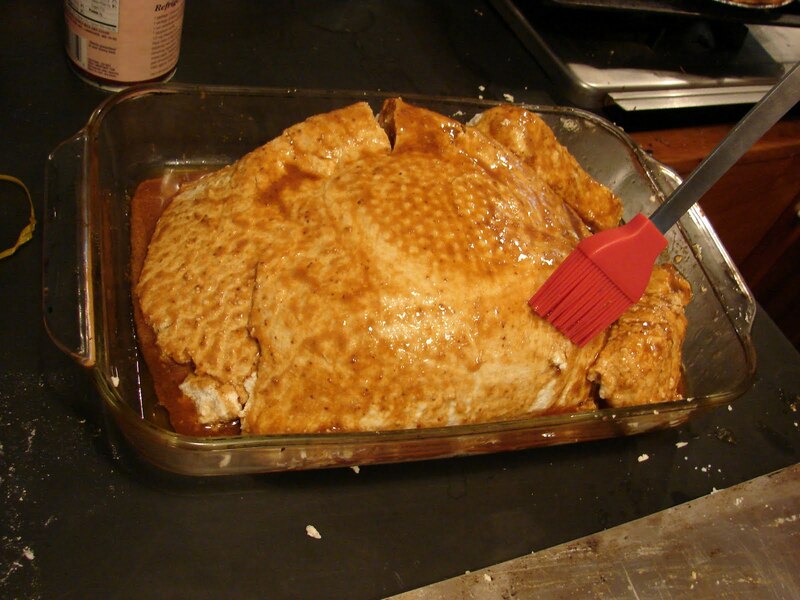 This main part of the turkey is formed by pressing mashed tofu into a colander lined with cheesecloth, then inverting this domed shape onto a baking sheet. The bird is marinaded with a mixture that uses dark sesame oil (available at Asian food markets) for a hint of meatiness. Some years ago, we had a family taste test of potato varieties from the garden, sampling them plain. Our favorite was Seneca Horn, an heirloom of uncertain origins. To us, it tasted of butter, mayonnaise, even cheese-- and that's with only a pinch of salt. 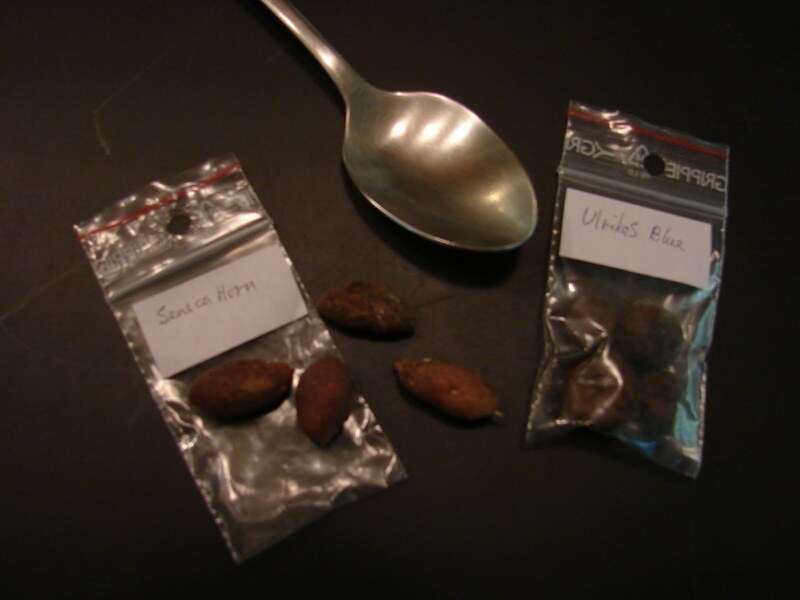 Nevertheless, the variety became unavailable anywhere-- until this year, when a Norwegian grower offered tiny olive-pit-sized tubers by mail, through Seed Savers Exchange (left, in photo). The challenge now is to get the little things to sprout eyes and grow to a reasonable size. And then to propagate this talented spud and make it available through SSE myself. The earth is the ultimate repository of all things lost and discarded (except for far-flung items of space junk, I suppose). Our place has was settled by German-Americans in the late 1700s and the soil reveals all sort of small treasures. One of the previous owners was a potter, and we keep finding objects like those I've painted here-- simple spheres that we guess served as bottle tops; the bottom of of tea cup; and a boldly patterned piece of Pennsylvania German slipware. So far, we haven't come across an entire object, only shards. But we hold out hope of discovering a piece we can put to use and restore to is place in the old stone farmhouse. This remarkable little fellow crawled out of our woods to find a sheltered place to pupate, and I brought it inside to pose. 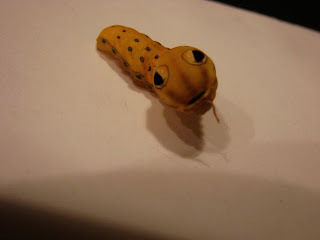 We identified it as the larvae of the Spicebush Swallowtail, a species known for its mimickry. As an adult, the butterfly benefits from its evolved (we can presume) similarity to a nasty-tasting species. The larvae starts out looking very much like a fresh bird dropping and therefore unappetizing to would-be predators. In its final form, the worm uses a completely different strategy, emerging with huge fake eyes and mouth to resemble (if vaguely, and on a small scale) a predatory snake. The eyes even have white highlights to suggest that they're round and glistening. After the photo session, I released the worm in the vicinity of a spicebush thicket and wished it a productive pupation. 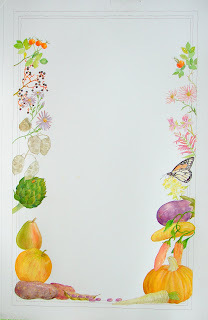 I've been gathering items from around the yard (and a few from the refrigerator) as models for the border of this wedding certificate, painted for a client. It felt good to slow down and focus on the plants; fall might otherwise have breezed past without my paying it much attention. As a household of four vegetarians, we go through plenty of chickpeas (or garbanzos), using them in pilaus, stirfries, and Italian sauces, as well as to make hummus. The canned item is fine, but I've wondered if a garden-grown chickpea would taste superior, fresh or dried. With that in mind, I ordered a packet of an East Indian variety, red channa, from a Seed Savers Exchange member and allowed them a few square feet of the garden. The feathery leaves are pretty, and so are the pale purple flowers. The cute little pods each hold two rather small peas, some already dried and others still bright green. 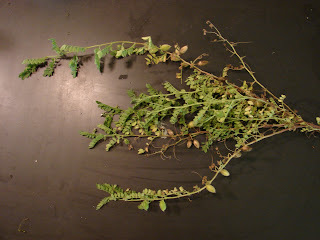 Less impressive is the yield-- my dozen plants yielded about a handful of shelled garbanzos, much of the crop having already been harvested and shelled by some sort of animal. If this sample seems special, we'll alot a long row to chickpeas next summer. And if there's a bumper crop, I may try to make the yellow tofu-like chickpea squares that are served fried in Burma as an important source of protein. One of our favorite ways to start a day is with a spicy, ever-so-slightly sour uthappam, the savory pancake of southern India. All sorts of garden vegetables can be tossed on the cooking batter, before flipping the cake over to lightly brown the other side: tomatoes, onions or scallions, and pepper (as hot as you please), all chopped finely so that they'll cook quickly; fresh cilantro; and cumin powder and salt. -- Presoak the grains and beans for at least 6 hours, then finely grind them in a processor. 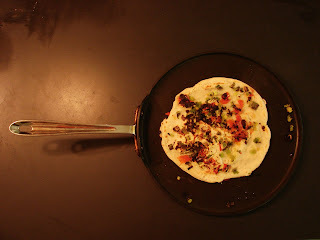 -- More simply, use rice and urad dal flours. The night before, prepare the batter with 2 cups water to 2 cups ground, presoaked rice (or rice flour) and 1/2 cup ground, presoaked urad dal (or urad dal flour). I usually add a 1/4 teaspoon active dry yeast to help initiate fermentation, but if the room temperature is comfortably warm, naturally occurring yeasts should be sufficient. The next morning, stir the cumin power and 1/2 teaspoon salt into the batter. Prepare the other ingredients and have them close at hand. For each pancake, pour about 1/2 cup of batter onto a large oiled pan over medium heat and spread it evenly with the back of a large spoon. Immediatley sprinkle the prepared vegetables over the top. When the bottom has turned golden brown in places, carefully flip the cake and continue to cook until it too is golden brown. Serve hot off the pan with yogurt. For years, our main vegetable garden has been surrounded (and somewhat protected) by a traditional white picket fence. Then, as the wood deteriorated, woodchucks discovered they no longer had to tunnel under the fence or vault over it; they could chew their way through. I'm now faced with the task of sinking new posts and cutting some 250 pointy pickets. Just as difficult is deciding on a new color. I bought three gallons of a clear, straightforward blue-- just a few shots of pigment in a white base. But asample picket (shown in the center) struck as too perky. I tried adding a tad of the chartreuese left over from our exterior doors (the picket on the right), but it looked too tamely Colonial. In contrast, the original picket now struck us as attractively cool and crisp. To bump up that side of its personality, I stirred in a little red acrylic paint, arriving at the picket on the left. 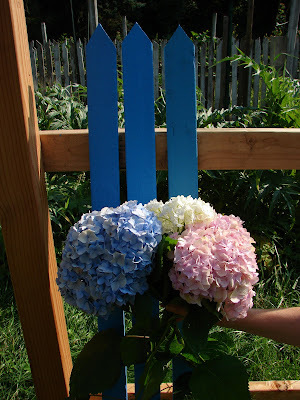 That's the one we've decided to go with, adding a border of blue plantings this fall--hydrangeas, Mertensia, iris, sage, ageratum. Curiously, when a cloud passes over the sun, the three pickets look nearly identical, making this chromatic fussing seem silly. I understand that hops grow as a vine and rely on something vertical on which to reach for the sun. But I put in five varieties favored for brewing IPAs and-- a year later-- have yet to supply them with a trellis. So it is that the five are crawling across the lawn. The trellis in my mind's eye looks like an arbor, with enough bracing to allow lowering it to the ground when harvesting the fragrant little cones. 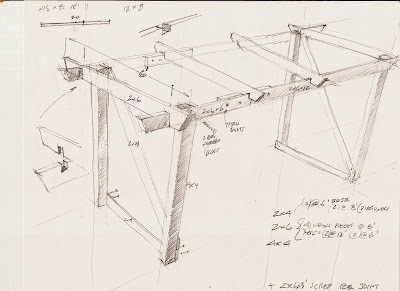 Here's the plan, needing only cedar and a bit of energy to realize it. The natural world usually does it right with color combinations. Seldom is seen a garish note, excepting for certain uber-exuberant blossoms engineered by humans. When choosing paint colors for our home, we tend to stick to white for the walls and comfy, nonchallenging Colonial hues for trim. But I recall liking the chartreuse doors on the stone railway stations along Scotland's west coast, and we decided to give that tooth-etching hue a try for our fieldstone house. We were guided by the foliage of a lime-mound spirea, its peculiar green tamed by a hint of warmth. After several trips back to our obliging paint store for just a tad more red pigment, we had it-- a color that attracts attention and occasional compliments. Since then, I've tried recording other happy color duos from the landscape; a few samples are shown here. I'm a freelance writer, editor, and illustrator, working out of a stone farmhouse in eastern Pennsylvania. A squat and funky stone farmhouse, that is, hemmed in on all sides by overly ambitious gardens and a trumpet vine that just won't go away. 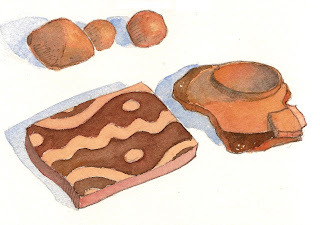 For a look at my books and watercolors, see www.rogeryepsen.com. You can order autographed copies of my books there. Or, shop via Amazon.com at the bottom of this blog. And, please, don't overlook your local independent bookseller, should you be fortunate enough to have one.